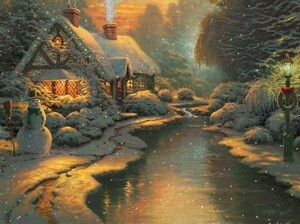 Who is waiting in the lovely creek side cabin on this snowy evening? They are staying nice as warm as you can tell from the animated smoke coming from the chimney. The creek gently flows while the snow continues to fall. All the Christmas lights blink in welcome.